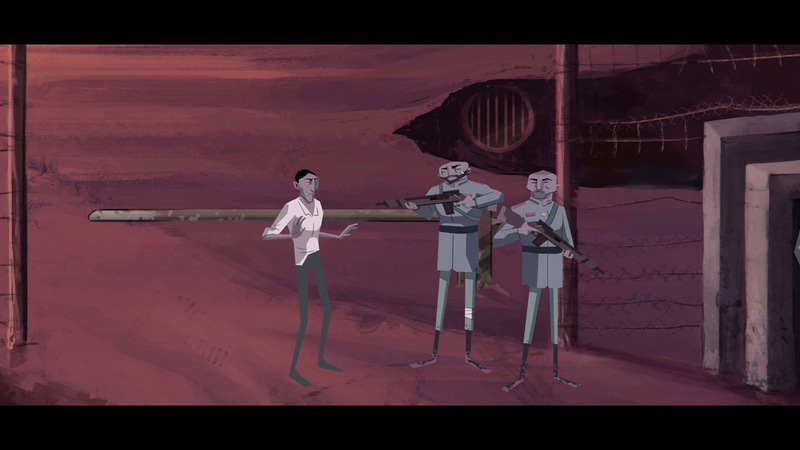 Dead Synchronicity: Tomorrow Comes Today is the first installment of a series of point and click adventure games developed by Fictiorama Studios and published by Daedalic Entertainment. The game features a serious, dark and, sometimes, gruesome story. After a series of catastrophic events that goes by the name of “The Great Wave“, an horrendous pandemic began to spread and nobody seems to have found a cure while time itself is collapsing. Michael wakes up without any memory of his past and meets the world after the catastrophe, a world where morals and history seem not to matter anymore. A world that lives by the motto: “You gotta do what you gotta do”. Fictiorama Studios developed the game trying to create an old school experience, inspired by “classic” adventure games, that would feature: lots of places to visit in an “open-world” approach and multiple puzzles to be solved simultaneously while advancing the story. The game is divided in four acts. At a glance: the first one is pretty linear, easy and “independent”. In Act 2 and 3 puzzles increase in number and complexity. In Act 4 things get easier again, guiding the player towards the end of the game. At the end of Act 1 you have basically two main objectives: find the cure for Colin and gain enough money to talk with Rose by finding some morphine for Misha’s husband. The journey to complete these two objectives will eventually lead you to the same place, which is the Facility, where you will find both the morphine and the reports about the cure (you won’t be able to leave the place if you don’t find the reports). Also, on your way back to complete these objectives you will have to save Misha’s kids from the soldiers, in order to get into the Camp again. All of the puzzles that you have to solve in order to complete these tasks are actually very intertwined. To take another step further, you have to break through a “wall” that block you from getting to the other side. You can’t get to Suicide Park if you don’t dig your way beneath it’s fence; you can’t get close to the facility if you don’t cut your way through the bushes; you can’t get into the facility if you don’t cut the electric wires; you can’t get back, past the Camp’s barrier, if you don’t save the kids first. After managing to tear down these four walls you will find out that Rose won’t help you if you don’t help her first and that Rod is so disappointed about the research for the cure being abandoned that he won’t help you either. The main goal of getting your memory back still keeps the same distance from you as you now have to face another series of puzzles. Colin has a message for you, so you have to distract Rod and his wife in order to speak with him, and Rose wants you to find her imaginary baby and his cradle. Granting Rose’s wishes lead to the only two simultaneous and non-intertwined puzzles in the game, even if to get to the things you need to solve them you have first to reach Beechwood Oracle (in other words, you have to begin Act 3). Once you get the key to Michael’s apartment from Rose, everything gets pretty straightforward. In Act 4 there are not many items to find or get. You basically retrieve “missing pieces” from puzzles you were introduced to earlier in the game, which felt all right when it came to Hunter’s request of getting him a picture of the fuel in exchange for distracting Rod, but it felt less ok about the sewers’ entrance, probably introduced too early game. You will have an actual reason to go down the sewers only in Act 4, but you can almost access them since Act 2, once you get the crowbar. By then, you can lift the manhole cover with it but can’t see anything down there because you have no light. Then, in Act 3, you get the flashlight after the soldier beats you, therefore you can enter and also have the light you needed (a bit strange is that you have to use it on the opened manhole, otherwise Michael will tell you he can’t see anything), but you have no map to find your way inside. Finally, in Act 4, you get the map and the real reason why you should go down there. The game ends leaving you with a never used item in the inventory: the broken lights you get in Rose’s van. The only thing you get out of them is an achievement, if you try to use them on one of the dead bodies in Suicide Park. Having something you can’t use with anything (and that also seems to have no value story-wise) can get frustrating if you find yourself going for a trial and error approach when trying to solve puzzles. This is just a thought, anyway, because most of the puzzles in the game felt clever and balanced. I didn’t have actual problems solving them. The only other remark I think I can make, is probably upon the puzzle that involves creating a commotion at the Camp in order to get the gloves from the soldiers’ motorbike’s saddlebag. Basically, similarly to the sewers’ entrance, it seemed that I had no clue of what was inside the saddlebag: the only thing that made me realize that it was part of a puzzle was that I couldn’t access it while the soldiers were nearby. Even if you don’t looknotice the saddlebag at all, the idea of causing a commotion is still justified by the phrases “The kids want to do something for their father” and “A little commotion on the Camp fence can be a good thing for everyone”. Also, Michael’s inner monologue when handing the slingshot to the kids as a reward for helping him, initially felt as if it was a moral choice you could take, rather than something that you had to do in order to go on with the story. Overall, I really enjoyed playing this game! Kudos to Fictiorama Studio for creating a great, mature story and a great set of interesting characters! I hope to play the second episode soon, because I can’t wait to see how it ends up for the New World and Michael! Dead Synchronicity: Tomorrow Comes Today is available on Steam and GOG.com. Please, everybody, go play this game!